Last week I took a half-day break from normal work to participate in the Forum des Métiers (Careers Morning) at the local collège (≈ junior high school). My task was to talk about the profession of translator and interpreter to six successive groups of pupils, aged 13-15. Each talk had to last about 30 minutes, and I quickly realised that half an hour would pass very quickly so I would really need to get the essential across. I created a Powerpoint presentation with about 15 slides on the following subjects: difference between an translator and interpreter, what we actually do, examples of texts translated and situations where an interpreter is needed, how and where we work, what are the qualities of a good translator/interpreter, how to become a translator/interpreter, and I finished by talking about the personal/professional life journey which led me to becoming a professional linguist. I purposely ended with this topic as I knew I could expand or shorten it as necessary depending on how much time was left before the bell. A chance remark by one of the teachers a few days before made me realise that some (most?) pupils don’t even know what a translator is/does, so I made sure I started the presentation with an explanation. I also showed some photos of humorous mistranslations, told plenty of anecdotes, and threw in a few questions (e.g. “how many languages are there in the world?”) just to make sure the pupils didn’t fall asleep. 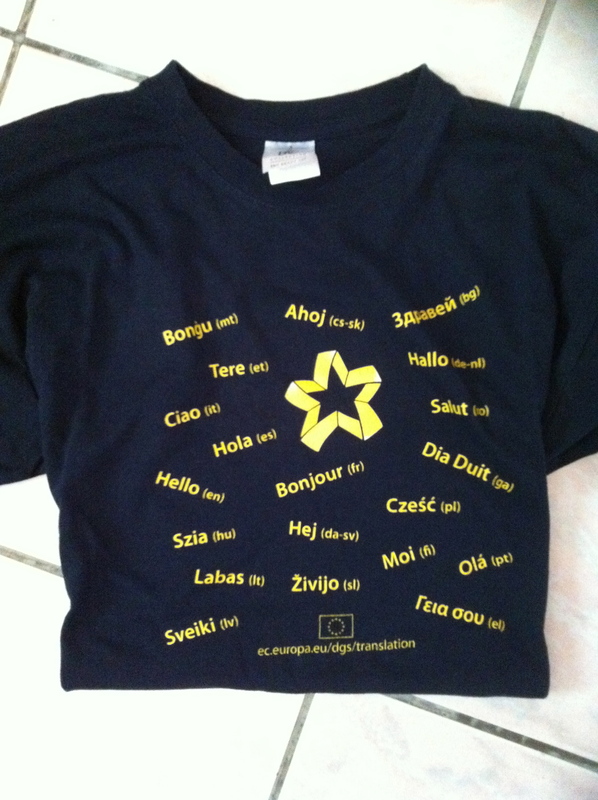 I made sure I was wearing this T-shirt which I won in this Translating For Europe competition. I’m not sure how many of the 85 collègiens I talked to will later work with languages, but in any case I hope most of the them went home that day with a somewhat better knowledge of our profession.